Lewis Hamilton’s amazing first season as a Formula One driver was acclaimed by Britain’s sports journalists today when he was named as their 59th Sportsman of the Year. Sharing top spot with Hamilton was Sportswoman of the Year Victoria Pendleton, who won three gold medals at cycling’s world track championships and is among Britain’s best hopes for an Olympic gold medal in Beijing next year. The Team of the Year award went to the England Rugby Union squad, who recovered from a poor start to the World Cup to reach the final, losing to South Africa. The awards, sponsored by BT Vision and UK Sport, were the result of a poll of the members of the Sports Journalists’ Association – writers, photographers, broadcasters – and were presented at a gala lunch in the City of London attended by nearly 400 from the worlds of sport, celebrity, politics and the media . The prestigious SJA British Sports Awards are the longest established prizes of their kind in this country, having recognised excellence in British sport since 1948. They have always been acknowledged as having special significance because they are determined by a ballot of SJA members – the sports journalists who cover sport week-in, week-out throughout the year. Hamilton, the 22-year-old from Hertfordshire, led the world drivers’ championship going into the final race of the season but finished a point behind the eventual champion, Kimi Raikkonen. Hamilton won four Grands Prix during the season and became the first driver to finish on the podium in his first nine races. Runners-up in the poll were boxers Joe Calzaghe and Ricky Hatton in the men’s section, with athlete Christine Ohuruogu and cyclist Nicole Cooke second and third in the women’s. 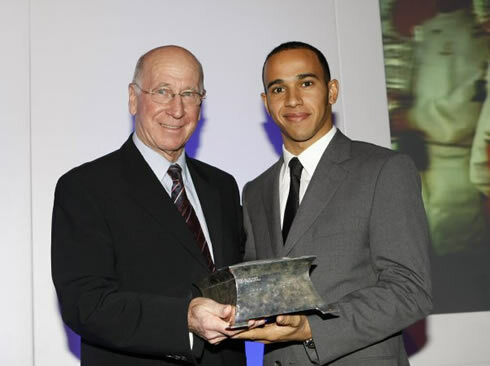 Hamilton’s achievement also earned him the Best International Newcomer award, while Ohuruogu, who returned from a year’s ban for missing three drugs tests to win the world championship 400 metres gold medal, was presented with the Pat Besford Trophy for an exceptional performance. Calzaghe, last year’s Sportsman of the Year, defended his world super-middleweight title for a 21st time during the year and was the recommendation of SJA President Michael Parkinson to receive the President’s Award. 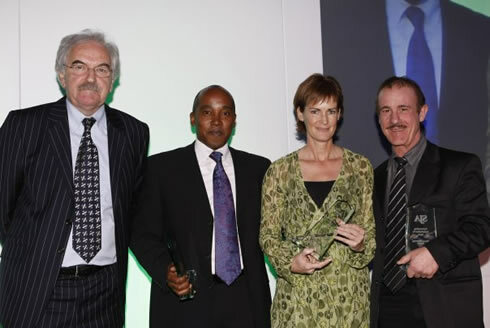 UK Sport’s award for fair play and inspiration went to world champion rower Katherine Grainger, while an unusual choice for the Outstanding Contribution to Sport award was a trio of parents – Judy Murray, Anthony Hamilton and Enzo Calzaghe – in recognition of the part mothers and fathers can play in the development of our sporting superstars. The Bill McGowran Trophy for Disabled Sports Personality of the Year was awarded to Cornish swimmer Jonathan Fox, a world record holder in the S7 classification. 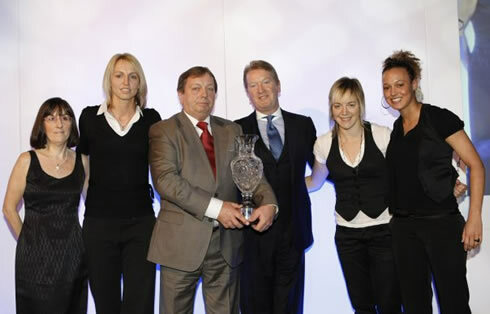 The SJA Committee Award recognised the feat of the Arsenal Ladies football team under coach Vic Akers, who completed a quadrupule of European Cup, Championship, FA Cup and League Cup. Hamilton and Pendleton join an impressive roster of past winners over the past six decades that includes Len Hutton, Roger Bannister, Anita Lonsbrough, Terry Downes, Tony Jacklin, Mary Peters, David Hemery, David Wilkie, Virginia Wade, Tessa Sanderson, Steve Redgrave, Stephanie Cook, David Beckham, Jonny Wilkinson and Paula Radcliffe. Hamilton is the first F1 driver to win the award since the late James Hunt in 1976. Beryl Burton, in 1967, is the only woman cyclist ever to have won the SJA Sportswoman of the Year award before 27-year-old Pendleton, winner of the team sprint, individual sprint and Keirin titles at the World Championships. The SJA’s next major awards event comes in three months’ time, at the same venue, The Brewery in Chiswell Street, with the prestigious UK Sport and BT Vision-supported British Sports Journalism Awards, for which the entry procedure, open to all sportswriters, on nationals, agencies and regionals, newspapers and magazines, in print and online, plus photographers and cartoonists, is now open. For the first time, the SJA British Sports Journalism Awards will include a prize for the outstanding young sportswriter, the Ian Wooldridge Trophy, named to honour the esteemed SJA member and Daily Mail columnist, who died earlier this year.